Hello again everyone, Pedro here! Much has been going on here in Athens, as I have now delved into my project. I’m studying the effects of the E545K mutation of the PI3Kα (phosphatidylinositol 3-kinase α) protein using molecular dynamics with enhanced sampling techniques, in particular metadynamics. The protein PI3Kα is an enzyme that, upon binding to membrane proteins, catalyzes the phosphorylation of phosphatidylinositol bisphosphate (PIP2). The product of this reaction (PIP3) then participates in a cascade of intracellular communications that has implications in cell growth, metabolism, survival, etc. Because of the key role of PI3Ka in promoting all these processes, mutations in this protein are actually the most common protein mutations that lead to the development of cancers. The E545K mutation in particular causes the disruption of interactions between two domains of PI3Kα, facilitating the detachment of theses domains from one another and leading to overactivation. Detachment of helical and sNH2 subunits of the PI3Kα protein with the E545K mutation. The wild-type protein would have aminoacid 545 as Glu instead of Lys. Knowing exactly the effects that the E545K mutation provokes at the molecular level is fundamental to develop drugs that can target specific structures in the protein and prevent the overactivation that leads to cancer. Molecular dynamics simulations can help towards accomplishing this goal, as they provide a detailed atomic description of the dynamic evolution of the mutated protein. However, standard MD simulations, even on modern hardware and large clusters, can only achieve timescales of up to microseconds. This is not enough to study large protein domain movements such as the one we’re interested in. This is where metadynamics comes in. It is a way to more efficiently explore the energy surface of our system, in order to arrive at relevant stable (minimum energy) configurations that describe our process, along predetermined geometric/functional variables (so called collective variables). Sounds complicated, but let me describe the basic principle with an analogy. Imagine you are Noah, and you are stuck in a valley with the Ark, having already saved all the animals in there. You can’t push the Ark out of the valley by yourself of course, the mountains are impassable. But then God lends a hand. He starts filling the valley with water. Suddenly, the Ark starts floating and keeps going up. Finally, when that valley is completely flooded, you are able to surpass the mountains, into the next valley. You explore this new valley, saving all the creatures in there. Then God repeats the process, filling in that valley and allowing you to escape to the next one. After a while everything will be flooded, but there will be nowhere left to explore either. I refer you to this excellent Youtube video where you can observe what I just described in a simple way. In this analogy, the valleys are the energy minima of our system, and the Ark is our MD engine, which allows us to explore the “energy landscape”. Metadynamics is the flooding process: in technical terms Gaussian functions are constantly added to our original energy surface, preventing us from being stuck in the minima surrounded by very large energy barriers (“mountains”). It’s a very powerful method, and has various parallel implementations as well. I’ve been analyzing results from metadynamics simulations already made, and I’m setting up a simulation myself to run on ARIS. 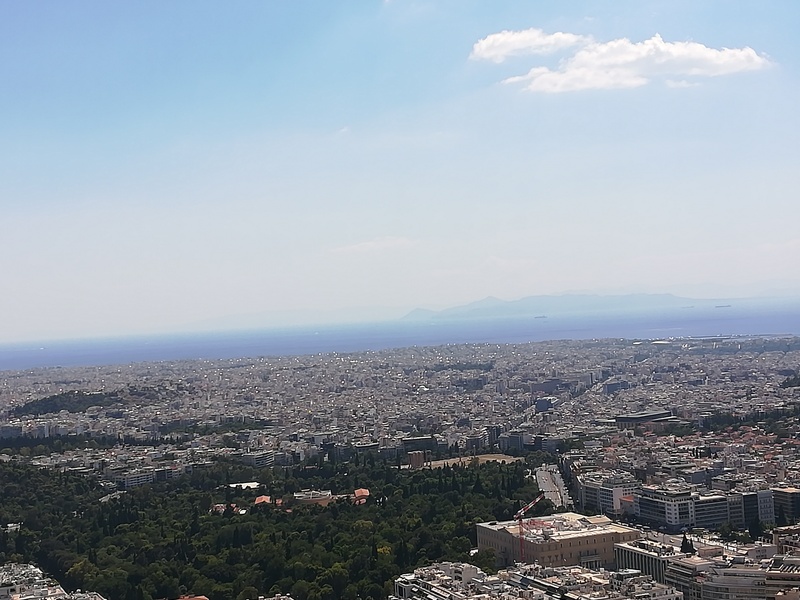 I leave you with another picture from my various trips across Athens, this time an incredible view of the city from the top of Mount Lycabettus. See you next time!